Jannu is the highest peak of the Kumbhakarna Section of the Kangchenjunga Himal, which straddles the border between Nepal and Sikkim. Jannu is entirely within Nepal. A long ridge connects it to Kangchenjunga on the east. Its official name is Kumbhakarna but it is still more commonly known as Jannu. In Limbu, the local language it is called Phoktanglungma. Jannu is the 32nd highest mountain in the world (using a cutoff of 500m prominence). It is more notable for its climbing challenge: it is one of the hardest peaks in the world in terms of technical difficulty, due to a complex structure, a large rise above local terrain, and particularly steep climbing near the summit. The first photo (from the top) shows Jannu as it is first seen in the distance whilst trekking to Kangchenjuga South Base Camp. Even from that distance the shape of the summit is very distinctive. In the second and third photos, taken from the Mirgin La you are very much closer to the South face. You can see the throne shape of Jannu. 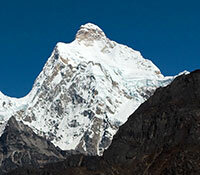 The mountain was first climbed from this side in 1962 by a team led by the French alpinist Lionel Terray. Their route started from the Yamatari Glacier south of the peak and followed a circuitous route to the large plateau known as the Throne (a hanging glacier south of the summit). It then climbed to the summit via the Southeast Ridge. The two black and white photos are interesting because they were taken almost 110 years apart from the same spot at the Selele Pass. Top was by myself using a Nikon DSLR in autumn 2008 and the bottom was by the legendary Italian photographer Vittorio Sella using 30×40 cm photographic plates. 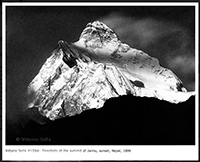 In 1899 British explorer Douglas Freshfield and Vittorio Sella were the first to circumnavigate Kangchenjunga and were the first westerners to see Jannu. Jannu's north face seen from an elevation near the settlement of Kambachen. In the foreground you see the terminal moraine of the Jannu glacier. Slightly closer view from the same location as above. You clearly see the massive wall of Jannu's North face rising vertically (it is even slightly overhanging near the summit) to 7710 m.
And that's me sitting at Jannu North Base Camp. Thers is only the narrow glacier separating me from the wall which rises 3km above me.